As cheetah populations continue to decline, scientists are calling on the IUCN to up-list the species from Vulnerable to Endangered. Little wonder considering their numbers have halved over the past four decades and that they are gone from 91 per cent of their historic range. You would think that they would at least be safe in protected areas, but high-volume tourism activity in the cheetah’s Maasai Mara stronghold is proving to be yet another stumbling block in the cat’s struggle for survival. Cheetahs have disappeared from 91% of their historic range. This is hugely problematic as cheetahs are a wide-ranging species. To be viable a cheetah population needs a contiguous, suitable habitat which covers about 4,000–8,000 km2. But few protected areas in Africa are larger than 4,000 km2. As a result, most of the cheetahs in the world – 77% – are believed to range outside protected areas. But this isn’t ideal for the animals as, from previous research we conducted using data from GPS satellite collars fitted on cheetahs in the Maasai Mara, we found that cheetahs avoid areas of high human disturbance and prefer protected, wildlife areas. These results show the importance of wildlife areas for cheetahs, but my most recent research shows that these protected spaces have challenges of their own. We found that the number of cubs a cheetah is able to rear is lower in areas that receive lots of tourists compared with areas that are visited less. This suggests that cheetahs aren’t getting the protection they need, particularly from the impact of growing numbers of tourists. Kenya’s Maasai Mara has one of the highest cheetah densities in the world, but it’s a landscape that is under increasing human pressure. Famous for its spectacular wildebeest migration, the Maasai Mara is a popular tourist destination. The wildlife areas of the Maasai Mara include the Maasai Mara National Reserve, which is managed by the Narok County Government, and numerous wildlife conservancies, each run by different management companies. The conservancies are formed through a partnership between Maasai landowners and tourism companies, whereby landowners receive a fixed, monthly payment for leasing their land for wildlife based activities on the condition that they do not live on the land, cultivate or develop it. Combined, the wildlife areas, which are predominantly used for photographic tourism, cover an area of about 2,600 km2 – one-tenth the size of Wales or Belgium. During the high season about 2,700 people visit the Maasai Mara National Reserve daily. But they are often not adequately managed. 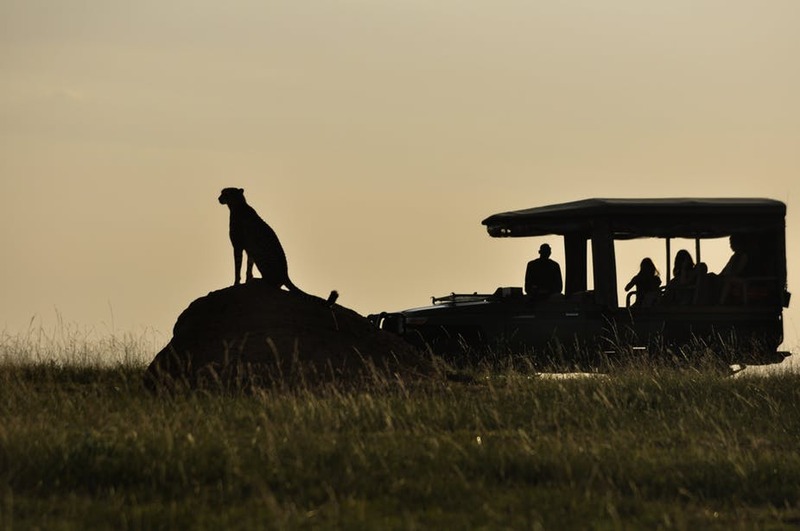 The Mara Reserve – with the exception of a conservancy called the Mara Triangle – doesn’t limit the number of tourists that enter the park per day, and there are no restrictions on the number of tourist vehicles at a predator sighting. It’s therefore not uncommon to see more than 30 tourist vehicles at a sighting. Ideally, the Mara Reserve should restrict the number of tourists, especially during the peak tourist seasons. Tourists also affect the landscape of wildlife areas. For example, tourist accommodation is continuing to increase in the Mara Reserve and these facilities are usually built on river banks which are prime habitats for species such as elephants, leopards and breeding raptors. One crucial element for a healthy cheetah population is cub recruitment, defined as offspring survival to independence. Cheetahs have relatively big litters, ranging between one to six cubs. But cheetah cubs can succumb to various factors including abandonment, poor health, and fires so the number of cubs that reach independence can be very low, ranging from 5% to 28.9%. I was interested in finding out if tourism is playing a role in this. By analysing four years of data on female cheetahs with cubs it became apparent that high numbers of tourists are having a negative effect on the number of cubs that reach independence. More specifically, females in areas with a lot of tourists on average raised one cub (or none survive) per litter to independence compared to more than two cubs in low tourist areas. There was no hard evidence of direct mortality caused by tourists. But my conclusion from my findings is that tourists are likely to have an indirect effect on cub survival. This could be because they lead to cheetahs changing their behaviour and increase their stress levels by getting too close, overcrowding with too many vehicles, staying at sightings for prolonged periods of time and by making excessive noise. My study highlights the importance of implementing and enforcing strict wildlife viewing guidelines, especially in areas where tourist numbers are high. The Maasai Mara’s wildlife conservancies are largely getting this right. Tourist numbers are limited to the number of beds per conservancy and only five vehicles are allowed at a sighting at any given time. cheetahs on a kill are not enclosed by vehicles so that they can’t detect approaching danger. If tourism is controlled and managed properly, it can play a very positive role in conservation. Money from tourism goes towards the creation and maintenance of protected areas – like the wildlife conservancies – and can help alleviate poverty. It also shows local communities the benefits that predators can bring and can positively influence attitudes. However if human pressures, like tourism, remain unchecked it risks having a negative impact on wildlife and could mean the loss of some of the biggest attractions – like cheetahs. This article was published by The Conversation. Read the original here.